SALISBURY, N.C.--(BUSINESS WIRE)--Mar. 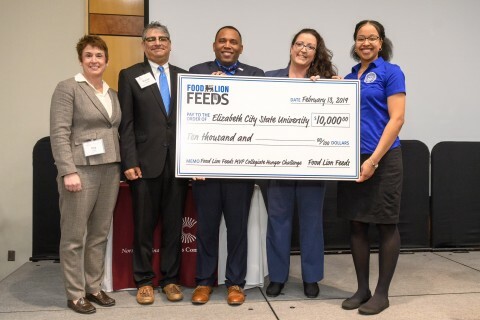 1, 2019-- As a result of an innovative new initiative to empower North Carolina college students to fight food insecurity on college campuses, Food Lion recently awarded both North Carolina Central University (NCCU) and Elizabeth City State University (ECSU) with $10,000 as part of the 2019 Food Lion Feeds Collegiate Hunger Challenge. The two schools were chosen out of 17 participating schools in the inaugural competition developed by Food Lion and North Carolina Campus Compact, an organization focused on civic engagement on North Carolina college campuses. In total, the 17 schools hosted nearly 140 events around hunger awareness and collected more than 77,000 pounds of food during the 2018 Fall semester to help nourish hungry neighbors on campuses and in the towns and cities where the schools are located. Each of the 17 participating schools had a unique approach, and a different set of ideas on how to deliver the message that hunger is prevalent on college campuses, and how to address that. While Elizabeth City State University led a competition kick-off event to start their food drive and continued it with a Fill-A-Bus food drive at one of the school’s football games, which collected more than 5,000 pounds of food, North Carolina Central University was particularly successful in helping to raise awareness of hunger on campus and in and around the community. To learn more about the Food Lion Feeds hunger relief initiative, visit www.foodlion.com/feeds.